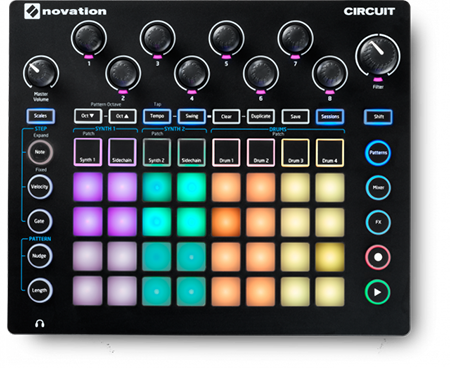 Novation’s Circuit is an inpirational, new grid-based groove box. Two Novation polysynths and a four-part drum machine, combined with an intuitive grid-based sequencer in a standalone box that will have you making electronic music in minutes. Hit some pads, tweak the knobs and your track will start to emerge, all locked in time and key. Play around with effects, patterns and sounds in real time, to produce your track, brimming with fat grooves and beats. Compact and battery powered with a powerful built-in speaker, Circuit can be used to make music entirely on its own. In the studio it will work alongside your standalone synth gear and run in sync with your music software too. Circuit is all you need to inspire, create and play new tunes.